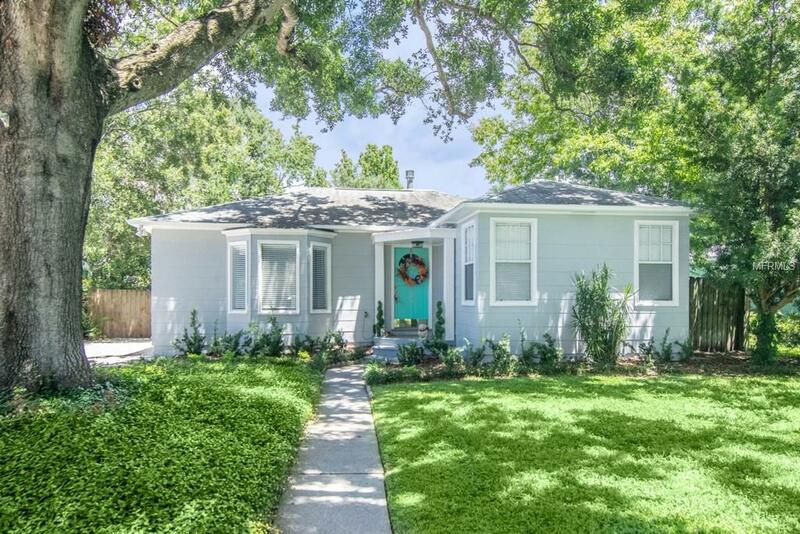 Charming South Tampa traditional home in the beautiful Bon Air/Grey Gables neighborhood, and in the highly sought after Plant High School district. This turn key home boasts gorgeous wood floors throughout, open living and kitchen floor plan, with a separate dining room. The kitchen has been updated with beautiful new countertops, cabinets, contemporary lighting and back splash, and all new appliances. A built in pantry and large island allows for extra storage space and a perfect space for entertaining. Enjoy the tranquil 650 sq ft master bedroom suite where no detail was left untouched. The master suite includes a spacious walk in closet, double vanity, large soaking tub, and separate shower with modern finishes. There are two additional bedrooms with large closets and an updated hall bathroom. An outdoor deck perfect for BBQs or relaxing under the lights is off of the living room with new french doors. The backyard includes pavers and xeroscape for limited maintenance as well as a carport/workshop and shed for storage. Located in the heart of South Tampa with easy access to restaurants, shopping, I 275 & the airport.